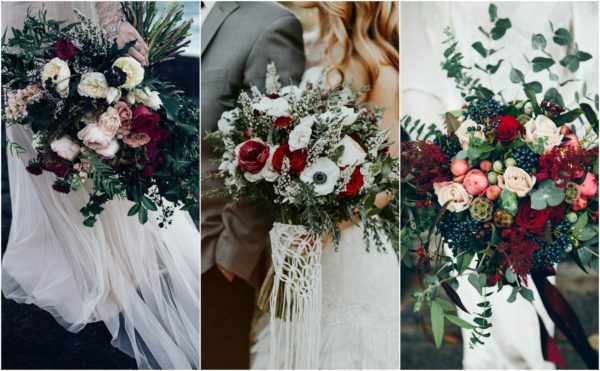 Let’s take a look at your Winter wedding bouquet. An abundance of greenery is an absolute must-have: sprigs of cedar, fir and eucalyptus will add bulk to your bouquet. Work in velvet red roses, burgundy anemones and a handful of Winter berries. Tie a silk red ribbon around the stems of your blooms for an extra elegant touch. Match the style of your bouquet to the groomsmen buttonholes. They’ll look handsome pinned to a thick tweed or woollen jacket – the perfect choice of suit for the colder months. Struggling to pick your favourite Winter flowers? Here at Lily & Lavender we adore working with blooms, and we can help you to find the perfect florals to make all of your bouquet dreams become a reality. 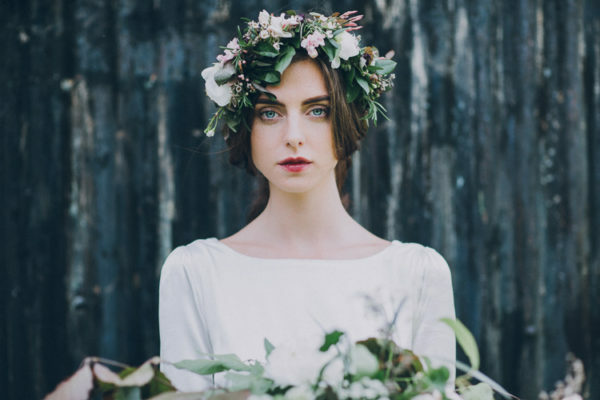 Flower crowns are always a popular choice for Spring or Summer celebrations, but they’re a beautiful way of incorporating Winter blooms into your overall look. You could use a few flowers that are featuring in your bouquet for a look that is completely coordinated and have your bridesmaids and flower girls to wear smaller versions of your bridal flower crown. We’ll move onto your ceremony décor. Have you ever considered creating a floral ceremony backdrop? They are super effective and create a special place for you to exchange your vows. A fir backdrop would look stunning hanging from the wall of your ceremony space, but we also love the idea of adorning a wooden archway with your favourite Winter blooms. You could even line your ceremony aisle with sprigs of fir and cedar, or alternatively tie them to the end of the aisle pews. Lily & Lavender can assist with the design of your wedding venue decor, so if you need a helping hand putting together the finer details don’t fret! 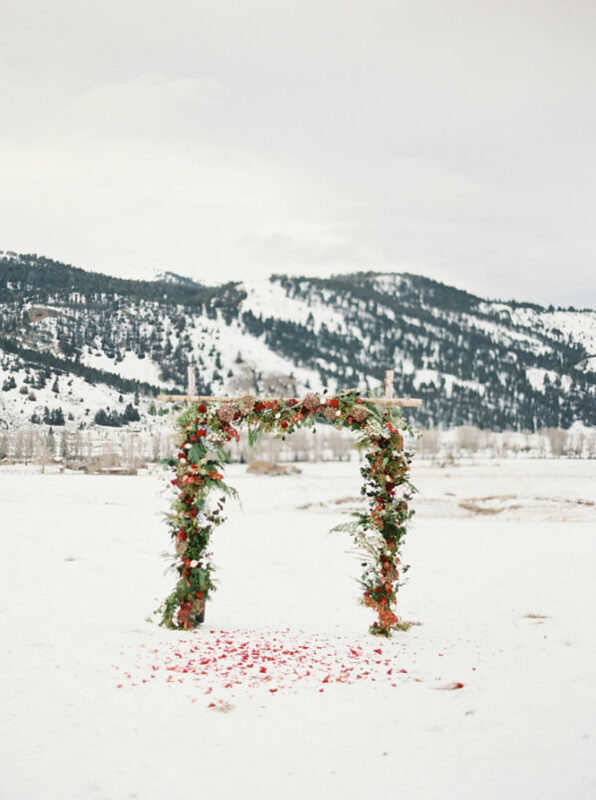 Welcome your guests to your wedding venue with a traditional Winter wreath hanging from the doorway. 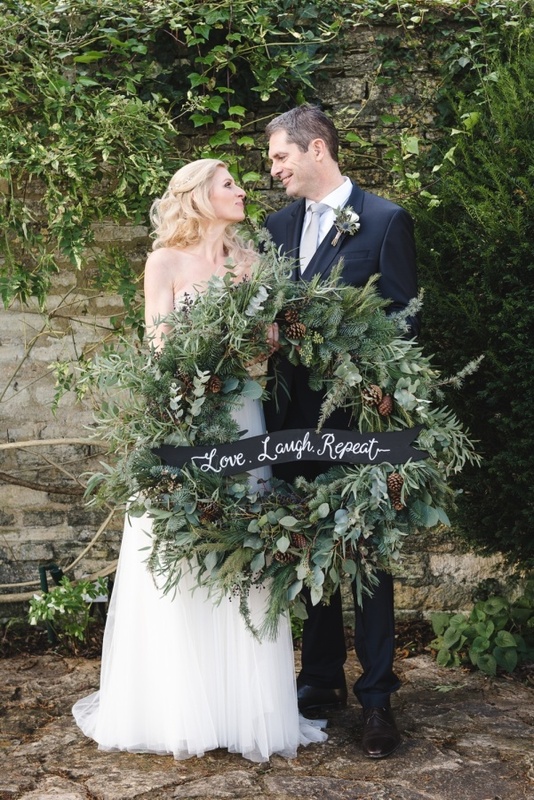 Wreaths look wonderfully festive and they also make for fab photograph props too! Why not hang some smaller wreaths from the Bride and Groom chairs as alternative chair covers? 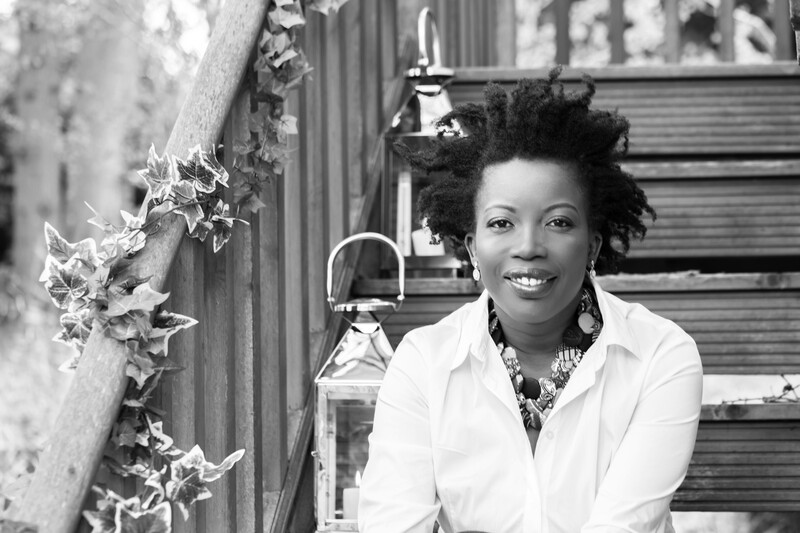 A Winter wedding venue needs to look warm, cosy and inviting. You can transform even the simplest of venues with the addition of a few floral and foliage garlands. Wrap them around the bannisters of a grand staircase or line one along a roaring fireplace. 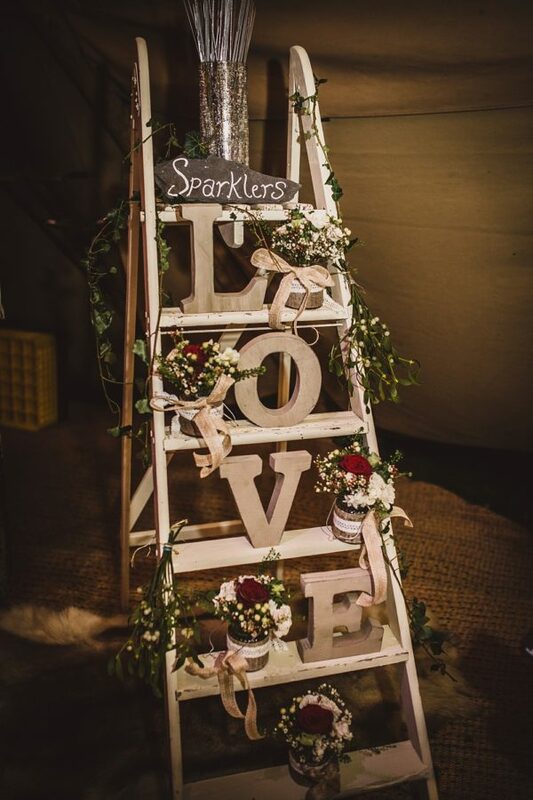 You can also use them to decorate your table plan, rustic ladders or wedding chairs. The options really are endless! It’s time to think about how to style your Winter wedding tables using flowers and foliage as your inspiration. If you’re having traditional round tables for your wedding day, a large vase brimming with luxurious red blooms and greenery will look beautiful. However, a floral garland lined along the length of a long wooden trestle table will look equally stunning. Work in scented red candles in golden holders for a romantic glow. When it comes to place settings, a simple white plate can be enhanced by tying a handful of berries to a napkin with twine ribbon. It’s the simple details that often have the most impact at weddings. 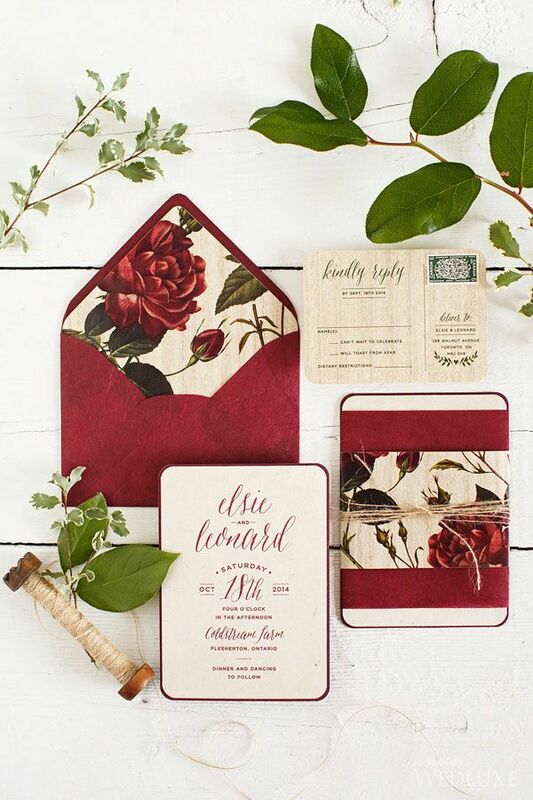 Opt for stationery with garnet red floral illustrations and dark green envelopes – it’ll really set the scene for your big day. 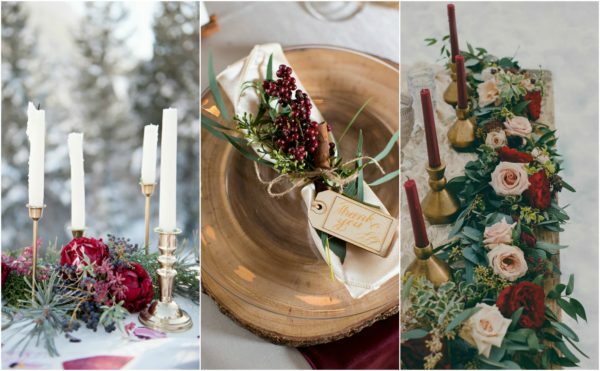 Flowers and foliage are the perfect inspiration for a magical Winter wedding. If you love the thought of incorporating blooms into your Winter wedding and are not sure how, simply contact Lily & Lavender here! We would love to assist! 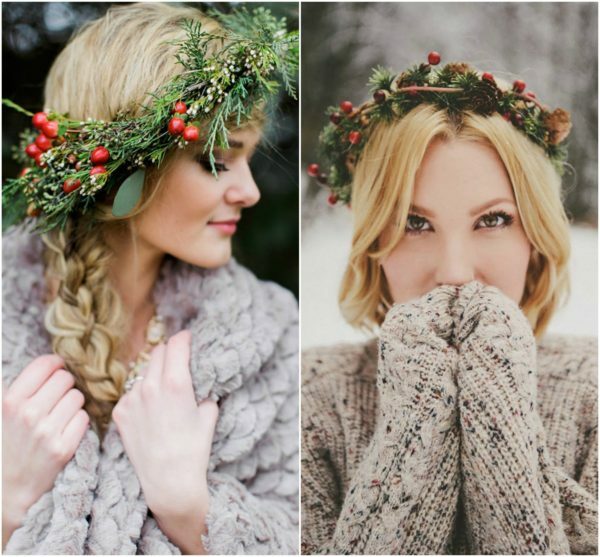 Gorgeous ideas for winter wedding chic! Great post!